I am thankful that my husband is allowed to work at home a few times a week. With today’s gas prices, and cost of living, every way you could pinch a penny, is worth it. However, that also means that I can’t do my work because I have to take care of feeding him…hahaha. 1. Heat up the oil on medium heat and sauté the garlic until about to turn golden. 2. Add the pork and stir constantly until brown. Add salt, pepper and ginger powder. 3. Spoon over cut up lettuce leaves. Garnish with green onion. Drizzle hoisin sauce on top. 1. Heat up about 2 tablespoons of cooking oil. Brown the gyozas on all sides. 2. Add about 1/8 cup of water to the pan and cover the pan. Simmer for about 3 minutes. 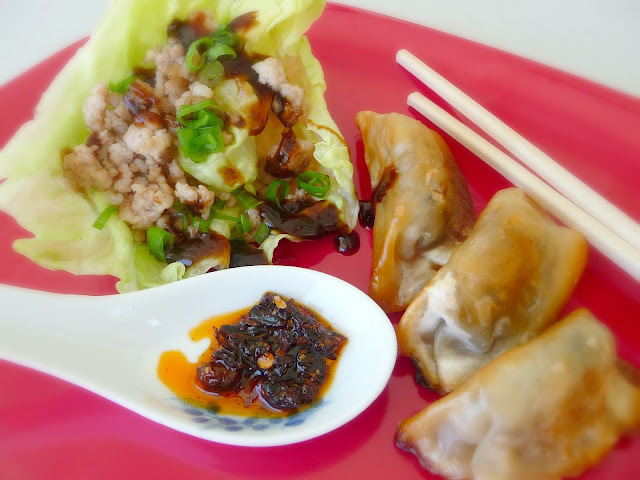 Serve with spicy dipping sauce or soy sauce and lemon.